Dr. Michael Lim is a Professor of Neurosurgery, Oncology and Radiation Oncology at Johns Hopkins. Dr. Lim obtained his MD from the Johns Hopkins University School of Medicine. He then completed his residency in Neurosurgery at Stanford University Hospital. Dr. Lim’s surgical interest is in both benign and malignant brain tumors, with a particular interest in gliomas (including ependymoma), meningioma, pituitary tumors and skull base tumors. He has extensive experience in new and innovative neurosurgical techniques including image guided surgery, microsurgery, minimally invasive procedures and endoscopic surgery. 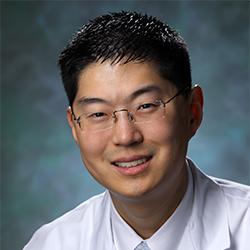 Dr. Lim is the Director of the Brain Tumor Immunotherapy Program at Johns Hopkins. Dr. Lim’s primary research interest is developing immune-based therapies against brain tumors. His research laboratory is focused on understanding the mechanisms of immune evasion by primary brain tumors. Findings from his laboratory are directed towards translation to novel therapies against brain tumors. In addition to running a laboratory, he also directs the immunotherapy clinical trials program at Johns Hopkins. He currently serves as the principal investigator of several large brain tumor immunotherapy clinical trials based on findings from his laboratory.